This will be my third year doing Project 365. Everyday, I make sure that I take at least one photo. A big part of the challenge last year was keeping up with organizing and posting my photos. I still have a few months of photos to post for 2011! This year, I’m working on two 365 projects. One with my DSLR camera and one with my iphone. The iphone 365 is so easy to do, especially because there is an app for it! 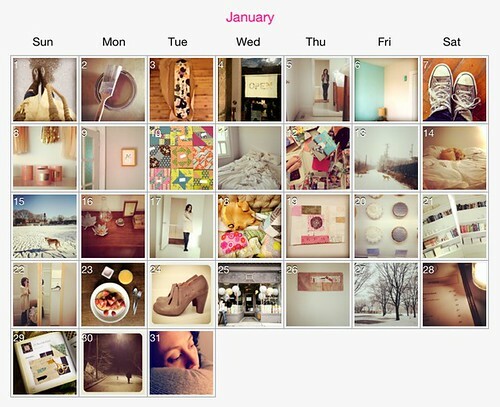 Project 365 makes it super easy to organize your 365 photos as you go along. At the end of the month you can download the collage of all your photos. I love it. If you’re on Instagram (I am make_something on Instagram), you may have noticed people posting photos all month with the hashtag #janphotoaday. Chantelle created a fun challenge that gives you a theme to use everyday. Happily she will be doing a new challenge each month. Here is February’s challenge. Having the daily theme keeps things really interesting and I love seeing everyone’s version of the same idea. p.s. I just added ANOTHER photo challenge to my roster. This one is #febphotoskill. Check out the daily details here. You would think I had nothing to do all day, but these little challenges make me feel creative in the midst of my busy work days! I love the colour palette of your month – so soft and calm. Beautiful images.